Puppies have a "critical socialisation period" between around 3-17 weeks of age.This is a really important window of opportunity for us to teach puppies how to socialise with other dogs and learn valuable lessons that will shape their adult personalities! Our staff run regular Puppy Preschool classes to help your new family member learn these skills in a fun and safe environment. Our classes run for four weeks (consisting of 4 x one-hour classes on a weeknight), and puppies are usually 7-18 weeks old. The classes are run here at the clinic (in reception or the carpark) for your convenience. - Nutritional advice: balanced, nutritious and delicious diets! - Body language: what is my puppy telling me? - Keeping your puppy healthy: preventing worms, fleas and more! - A fun, supportive and relaxed environment for your family and puppy! Please call us on (02) 6964 1999 to discuss the next upcoming class available and avoid disappointment! Pictured: "Thunzi" from our September 2016 graduation class! "It was great and is a good experience for the puppies to learn to play with other dogs"
"It was great and fun!" 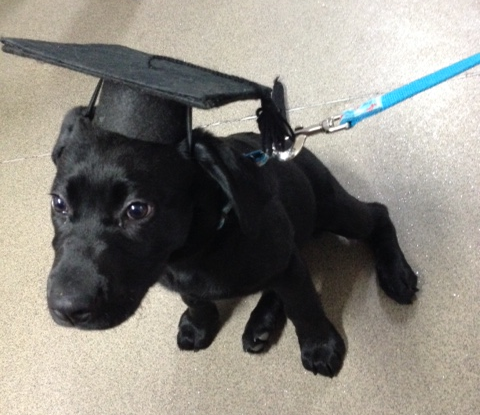 "A lot of good information was covered"
"I would definitely recommend puppy school to my friends"